Growing up in the middle of Africa we were a tight knit community who played and drank together. One of my compatriots was a cattle rancher who dabbled with paints - pretty good at it truth be told. He supplemented his operations by becoming a professional hunter until that operation became the most lucrative side of his business and went full time. This close association with wildlife enabled the artist in John to fine tune his anatomical appreciation of his future subjects. 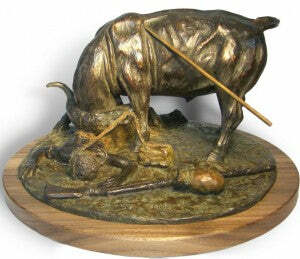 Being the artist at heart, John took up sculpture and began producing bronze figures. 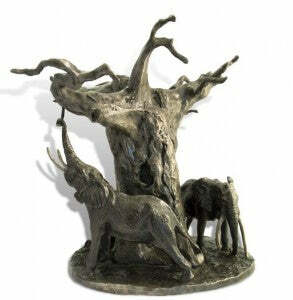 John has moved on from his hunting days and now produces bronze sculptures of African wildlife scenes as a full time occupation. The detail and expression with the aggression of the buffalo (left) intent on getting his own back on his tormentors is finely evident in the sculpture. In years gone by Arabs traded off poor quality muzzle-loader guns for slaves and ivory. I wonder how many poor souls who ventured after the Cape Buffalo with these weapons actually ended up in the same position as this tribesman. That he was not alone is obvious due to the spear that it is sticking out of the animal. This sculpture is a common occurrence in the wild where a leopard (right) seeks out its natural prey in the form of a baboon. Seconds from death, what choice does the primate have but to turn and try to frighten his adversary away? I am sure that his gallant effort was to no avail. 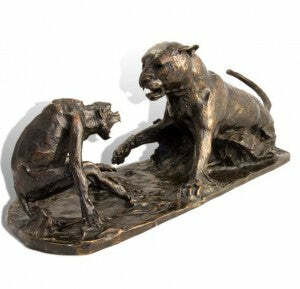 This bronze is a fantastic portrayal of what happens in real life and captures the fear and hopeless aggression of the baboon - knowing his life is coming to an end. One of my favourite sights was to see an Elephant (left) underneath a Baobab tree. Both giants of their type, the juxtaposition of their shapes always sent a tingle down my spine. Elephants used to feed off the bark of baobabs and to see the raw, pale flesh where the bark had been ripped off against the dark grey of this massive tree was always a reminder of the power of an elephant. John decided to make this a night-time scene and called it "Moonlight Under The Baobab." With light above the piece and in the right setting, I'm sure will achieve the mood that is sought. John is now based on the east coast of America and may be contacted via his website Bronze Africa where African wildlife scenes cast in bronze may be viewed. There is an extensive gallery of his work for your appreciation. You never know - you may be able to obtain a piece that will become a collectors item of the future.